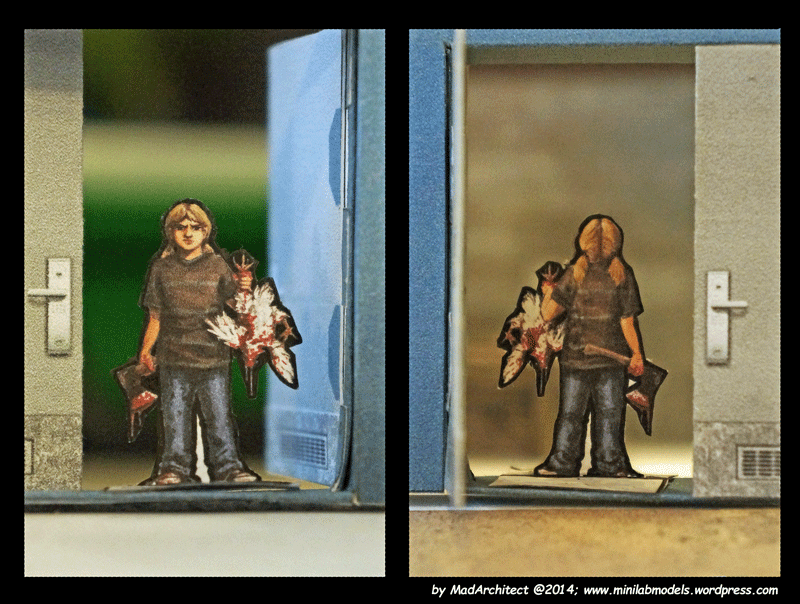 Because there were always some of them in medieval Courts of Europe… Here is another set of Codex Manesse miniatures. First five minis to the left are monks. Judging by their habits we ave here three monks of the Order of st Benedictus (first, fourth and fifth from the left). Two of them are carrying pastoral staves, are probably abbot and a prior of a convent. 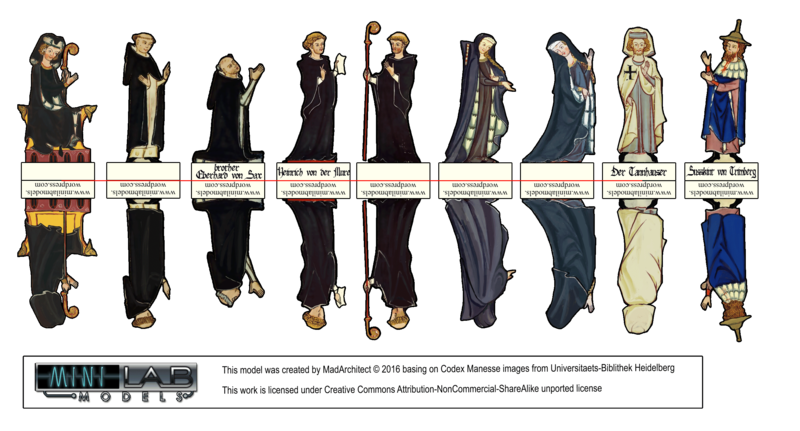 With their motto “Ora et labora” Benedictines were one of the oldest and most significant orders in Europe anbd their monasteries were a vital element of medieval landscape (both geographicaly and socialy speaking). 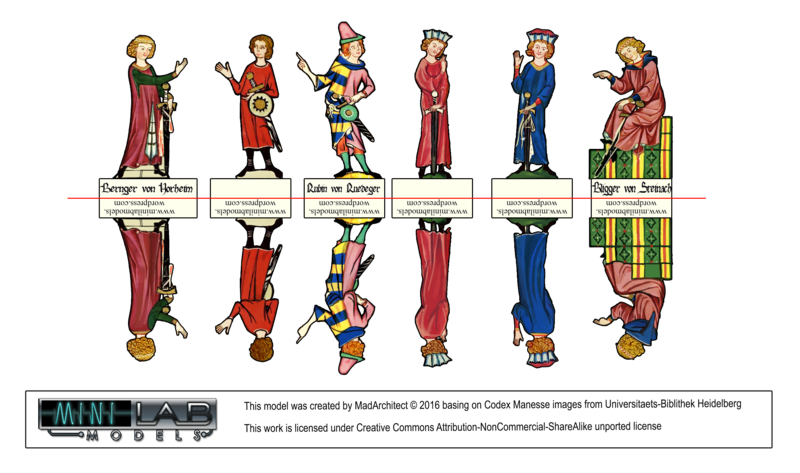 A year without Codex Manesse… shame on me I guess… Anyway the theme of this modest update is – a sword. Not as a tool of war, but as a symbol of status. Browsing Codex Manesse miniatures you may notice that many images depicting knights during very “civilian” activities like reading a letter or contemplating a poem there is often a sword around hanging on the wall or simply standing somewhere (see Emperor Heinrich).From narrative point of view the sword adds nothing to the image and the narrator could just omit this detail (wchich he often does), however the presence of a sword underlines high status of the man depicted. For a medieval man sword was not only a tool of murder or a portable shrine making an impromptu cross when stuck in the ground. A sword was a powerful symbol – it denoted knighthood, justice, virtue, authority, Christendom and possibly had many other now not entirely clear meanings. Practical – having something heavy (ok i know that original swords where not that heavy but still) and cumbersome dangling around your leg for a better part of a day could be annoying. There are accounts of II WW officers complaining on the weight and discomfort of carrying their sidearms on their hip – it could be the same with the sword. Informational/Symbolic. – When carried by the side, a sword is not always in sight, especially when the bearer was wearing a cloak. However it is hard to miss when guy you’re looking at carries it in hand or resting on his shoulder and regardless of many romantic or chivalric, symbolical meanings of a sword the most obvious one was – power. When a sword was in sight all people around immediately knew things just got more serious. Well… is out as a demo set. Finally I’ve finished the well set, and it is out there (on WargameVault) for grabs as MiniLab’s “pay what you want” demo set. I hope you’ll like this little model. If you will try it tell me what you think. All feedback is welcome. Ok. I’m not dead and neither is the blog, but it is kinda… hibernated. Hopefully I will be back in a couple of weeks/ months when Ill manage to climb out of a pile of mundane work. But for some time posts may be hmm… even more irregular than usual. Having some time for myself only when I’ll convince myself I don’t need to sleep I use it lately to dust off my drawing painting skills. Poked by friends and family i started to put some of my newer and older drawings on the web. So if you are curious what is keeping me from making more models you can visit my Deviantart gallery. You can meet there some friends of Aspasia A. A. Achsenberg that I hope one time will make it to a set of steampunk/ victorian adventurers. And while we are with Aspasia – a winner of Papercut Awards 2013… Until I’ll find some time for more miniature modelling I highly recommend keeping an eye or two and follow this year Papercut Awards contest. For those who don’t know what I’m speaking of. 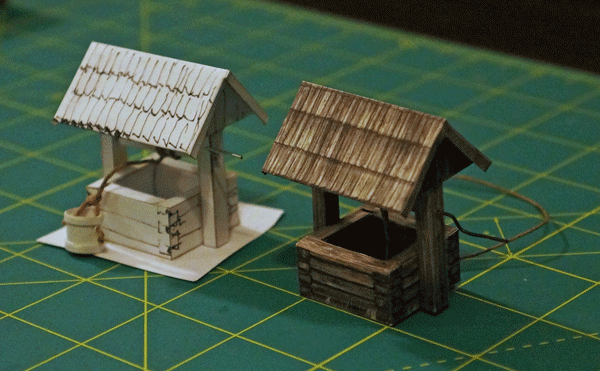 It’s a contest about making paper models and miniatures for tabletop games like wargames or RPG. So if you draw some miniatures/ design models from time to time on behalf of organizers (and whole Cardboard Warriors community I believe) I invite all pen/and scissors able ladies and gentlemen to take part. And if you only use other people creations in your games you can still participate in “papercraft in action” showing your modelling skills and ability to create drama with papercut means. Rules of participation and rewards (one book shelf gift certifiactes and sometimes other) you will find below. Papercut Awards 2015 contest rules. Sometimes, especially when you have almost no time for hobby, you need do put aside more complex projects just to make something different that you can finish in a short time. Its a kind of mental hygiene I guess. Below you can see my last such “fast and simple” project. 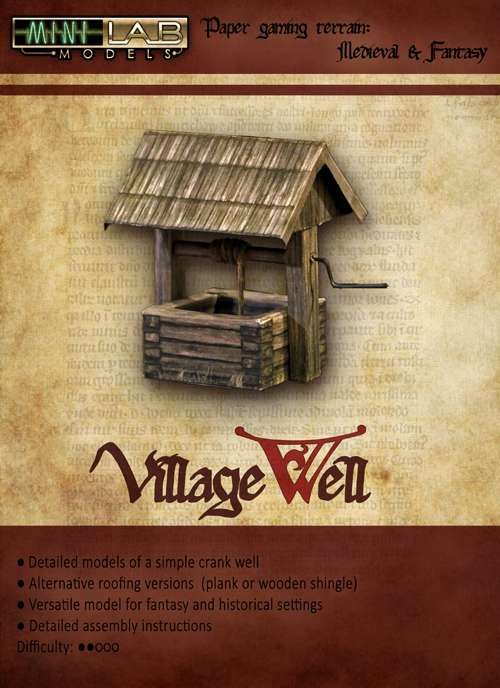 A simple crank well. A universal design suitable for many fantasy, or historical settings spanning 2500 years. Below you can see the first test build and a test print. Today another (after the church) simple 3d model for Codex Manesse range. This time it is a knightly pavilion loosely inspired by Winli’s tent. 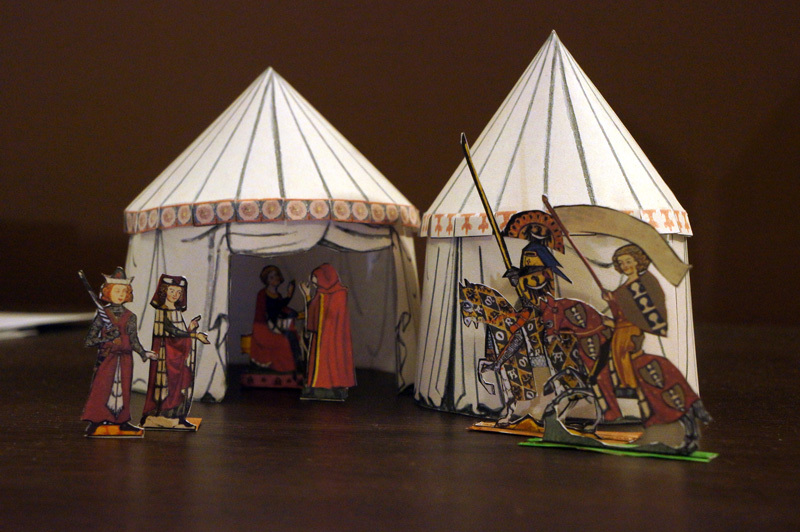 It is one of most commonly depicted (though not necessarily most common) kind of tent of high-to-late middle ages – round pavilion supported by a center pole. (As this model was to be as simple as can be, the center pole is not included :D. You can easily make one of paper roll or bamboo skewer). How the perimeter of the tent was erected is not entirely clear. Several concepts are used by re-enactment groups and experimental archaeologists with spoked wheel concept being most common. As you can see the tent is actually almost as big as CM church. I tried to keep it’s relative size to characters, according to original miniature and Codex Manesse art canon, and that demands inconsistent scaling of “architecture” elements :). Anyway the model is fairly simple to make. Simply cut out elements, fold togue tabs and insert them into slots marked with corresponding letters, then put the tent top on the walls, and that’s it. The tents should stand on its own with no glue required (depending on paper density), allowing easy assembly and disassembly for storage. You can always glue it together if you like. Click on the image below to download PDF file allowing you to make a closed or opened tent with 3 different scallop patterns (Use layers tab to turn desired options on or off ). To add size variety to your tent field you can cut out some segments of the tent to make narrower but taller tents. (The tent to the right on the photo above had 4 scallops and corresponding wall sections cut out). I bearly managed to find time to submit a single mini, but not enough to prepare a proper presentation, or even a photo session. (This is supposed to mean “sorry for the quality of photo below). Still it was enough for 4th place. This is Daria, a not so ordinary kid in a postapocalyptic (or actually sort of trans-apocalyptic) world. Here you can find my submission, and a brief description of the scene. 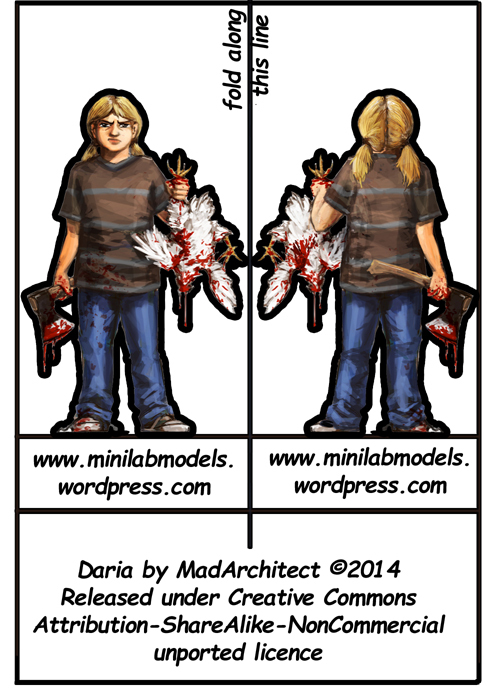 According to new rules of Papercuts all submissions were to be free to download so, you can download miniature of Daria here. I think that overall level of the competition was slightly better than last year with some really cool concepts and/or executions. Congratulations to all the winners. You can browse all submissions on Cardboard Warriors board here. Especially best of show winner is worth your attention with some cool rain effect’s printed on diorama. You can also browse all submission photos and download models and miniatures on OneMonk page.